Learn how to bank low- to mid-value strange weapons and cosmetics. Guide: How do I buy Stranges? I want to buy strange weapons for metal, how do I buy Stranges? This is the strange weapons page. Scroll down a little and you'll see all the bots. Here you choose the weapons you want to buy. I've selected a Strange Pretty Boy's Pocket Pistol and a Strange Cleaner's Carbine. To the left you can filter your weapons if you for example only want to see Engineer or Medic weapons. To the right you'll see how much you'll have to pay for the weapons. Now you'll see your backpack. Here you can choose if you want to trade your Strange weapons for the Strange weapons you selected before or if you want to pay with keys. 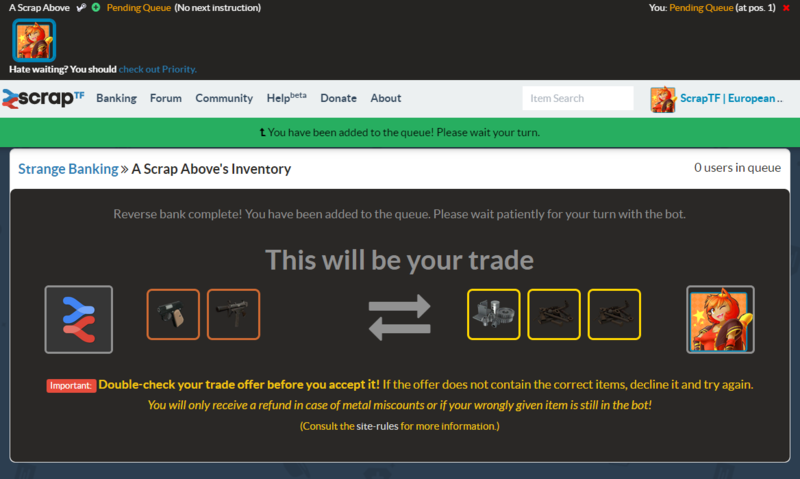 I want to pay with metal so I don't select anything and hit the "Trade Now!" button. You can see what the trade needs to look like. 2 Strange weapons for my 1 Refined and 2 Scrap metal. You've now succesfully completed a Strange weapons trade! Congratulations! Guide: How do I sell my Strange items? I want to sell Stranges for metal, how do I sell my Strange items? This is the weapons page. Click on the "Sell Stranges" button to begin. Here you choose the Stranges you want to sell. I've selected a Pretty Boy's Pocket Pistol. To the left you can filter your weapons if you for example only want to see Scout or Demoman weapons. To the right you'll see how much you'll get for your Stranges. You're now in the queue to sell your Stranges. You can see the queue at the top of the screen. I'm currently in a "global queue" which is what you'll be in at the start. Then you'll be assigned to a bot to trade with it. You might be in a queue for a minute or so. You can see what the trade needs to look like. 1 Reclaimed metal for my Pretty Boy's Pocket Pistol. You've now succesfully sold your Stranges! Congratulations! 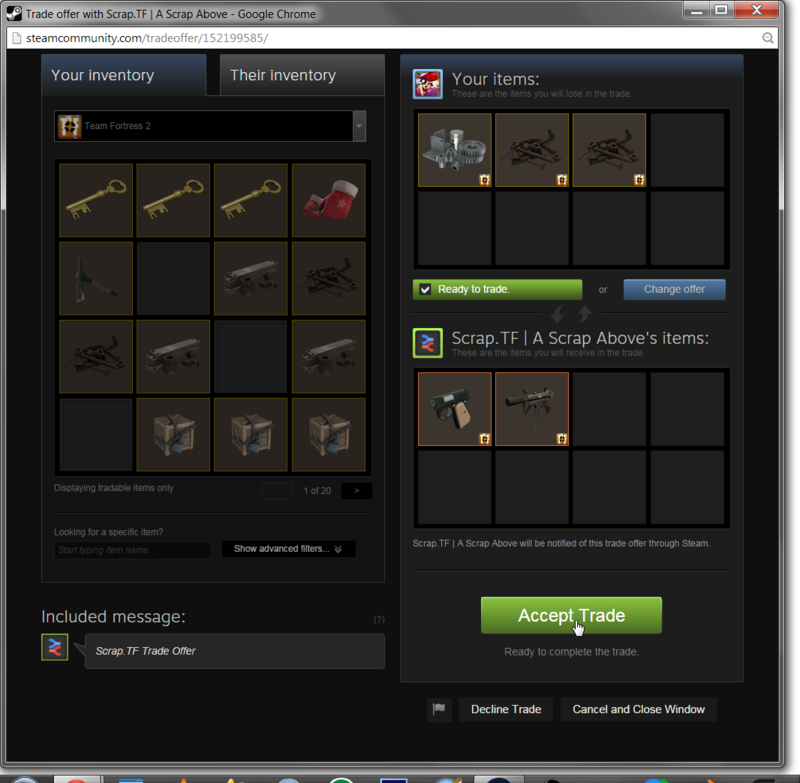 Where can I trade high value and australium Stranges? 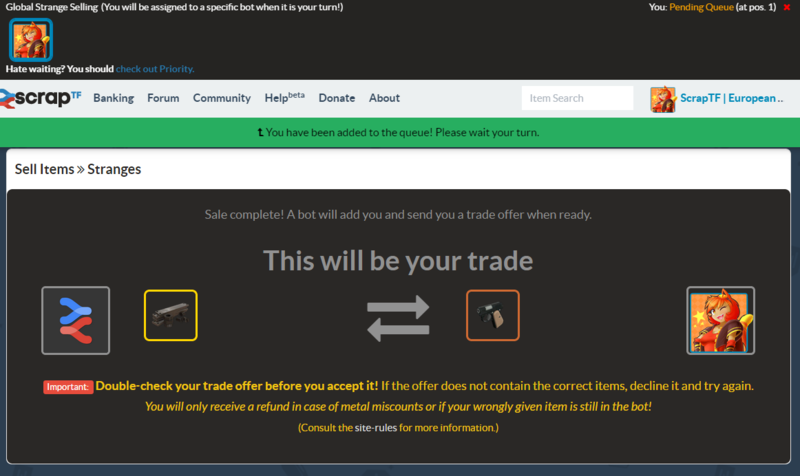 High value (select Stranges obtained from salvaged crates) and australium Stranges can be traded through our item banking. Do the bots pay any extras if my item is killstreakified or have any extra parts? Yes and no. Our bots will offer you a higher price for said strange item if it has any strange parts attached to it, but the price difference will not be much. On the other hand, we do not offer any extras when said item has been killstreakified. Remember that we will not accept your refund request if you are unhappy with the price that the bot offered and that you ACCEPTED. What is the stock limit of strange banking? The bots set an item as overstocked when they reach 15 units of said strange weapon. This means that if the total of said strange weapon in all bots is 15, then we are not buying any more until we sell some. 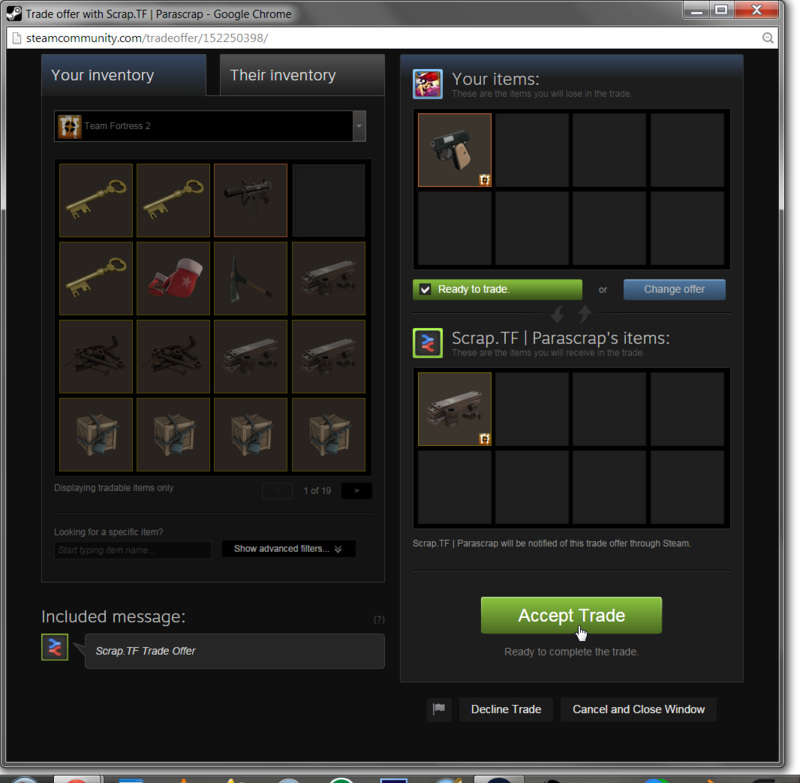 Where can I sell my high value (salvaged/australium) Stranges? Many expensive items, such as these Stranges can be sold to our item banking bots.